Chrichton's World: Review Raines (2007): Too bad that this show never got a real chance. Review Raines (2007): Too bad that this show never got a real chance. Another crime drama with an original approach. Solving crimes in TV shows and movies has been done to death. So what does "Raines" add to this genre. Well plenty. First you have Jeff Goldblum. A very charismatic actor who always is convincing as a genius with certain flaws. 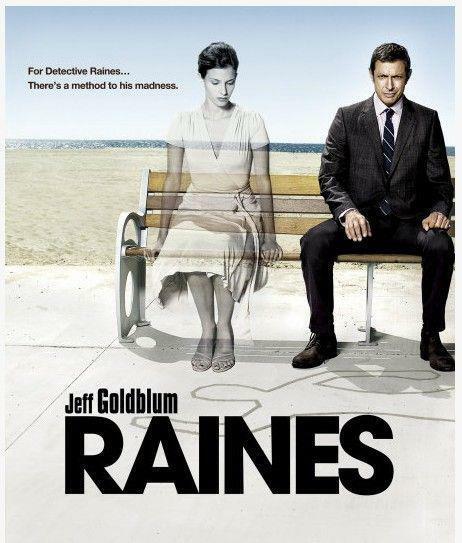 In "Raines" he is a detective who is literally seeing his murdered victims. He only gets rid of seeing them when he solves their murder. The brilliance of this peculiar matter is that it all is happening in his mind. It is not certain if he is mad or becoming mad. To me it seems like a tool for him dealing with the murders and the death of his partner. It actually helps him solving the cases. Sometimes he has the feeling that he is losing control. And is afraid that people will find out. There is more to this and we would have found out eventually, if the show wasn't cancelled that is. Each episode is full of little twists and turns that will let you keep watching. Especially on the drama front. It is nice to see different sides of a murder victim to get a more objective view. And it is fun to watch what is going on with Raines. I like the fact that sometimes he is helping the friends or relatives of the murdered victims. It is noble and touching. Too bad that this show never got a real chance.